Styles make for good boxing bouts and according to former UNLV All-American Jeremy Anderson, that should also be the case with “The Match,” Nov. 23’s pay-per-view duel between Phil Mickelson and Tiger Woods at Shadow Creek. Former UNLV All-American Jeremy Anderson (left) is giving longtime friends Tim (second from right) and Phil Mickelson (far right) advice about Shadow Creek prior to $9 million winner-take-all match against Tiger Woods at Shadow Creek. They are shown with Dave Harbour at this year's San Diego State vs. Arizona State football game. Photo courtesy Jeremy Anderson. Styles make for good boxing bouts and according to former UNLV All-American Jeremy Anderson, that should also be the case with “The Match,” the $9 million winner-take-all, pay-per-view duel between Phil Mickelson and Tiger Woods at Shadow Creek on Nov. 23. 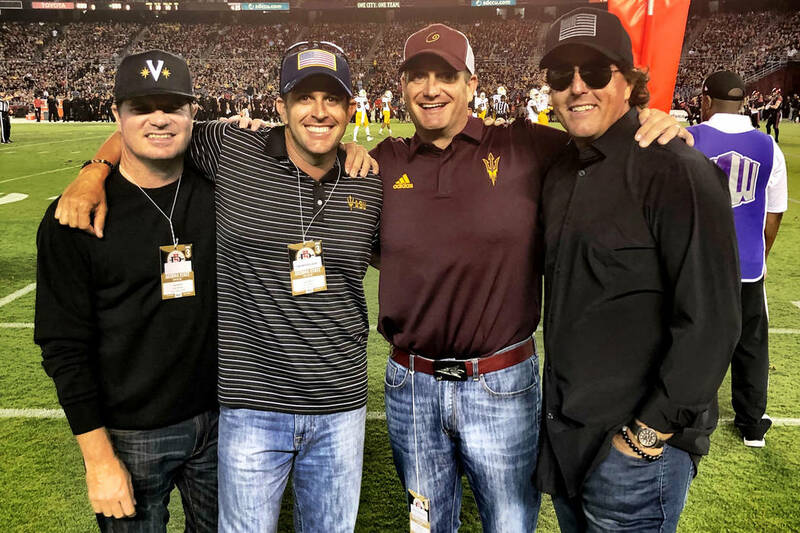 Anderson, a member of the 1998 UNLV national championship team and a former PGA Tour golfer, played and scouted Shadow Creek on Thursday with Tim Mickelson, brother and caddie of Phil. “Tiger is more of a tactician when it comes to thinking his way around a course and Phil is more go-for-broke,” Anderson said. Anderson still lives in Las Vegas but has retired from professional golf. He has known Tim since junior golf and Phil since they met while Anderson was a UNLV senior. Upon turning professional, Anderson signed with Phil’s management company, headed by Steve Loy, at the urging of the Mickelson brothers. Phil also took the young pro under his wing immediately, something Anderson never forgot. Anderson was asked to help devise a game plan for The Match because he has played Shadow Creek hundreds of times, with a career best of 64 there. Phil played a few holes at the Tom Fazio-designed course recently while filming HBO’s “24/7,” but according to Tim, hasn’t played a full round at Shadow Creek in many years. Phil does plan to play it Tuesday and Wednesday. Woods could have an advantage because he shared the pre-renovation course record of 60 with Fred Couples and has played it many times. Woods also hosts Tiger Jam, an annual fundraiser for his foundation, at Shadow Creek. Tim is intrigued with the broadcast format and advised aspiring golfers to watch. “Both Phil and Tiger are predicting they will win on the 17th hole,” Tim said. “All I know is that it is going to be fun, exciting and interesting, and it will come down to who has the better day. If the match does come down to Tiger and Phil’s predicted finish on the downhill par 3, 17th hole, Anderson told Tim, “if the wind is blowing, don’t even bother throwing up grass to gauge it; just have Phil hit it and hope. If you throw grass up 10 times, the ball will fly a different way than the grass does 10 times. Freelance writer Brian Hurlburt can be reached at bhurlburt5@gmail.com or @LVGolfInsider. Who: Tiger Woods vs. Phil Mickelson. What: A $9 million winner-take-all golf round. Where: Shadow Creek Golf Club, North Las Vegas. Tickets: None for the public. TV: Pay-per-view on cable, satellite and streaming.